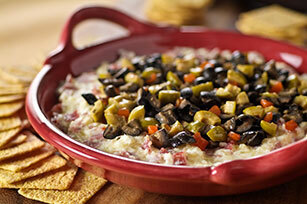 Made with ham, salami and olives, our cheesy baked Muffuletta Dip is a delicious take on the classic New Orleans sandwich. Mix next 4 ingredients; spread onto bottom of 9-inch pie plate. Bake 15 to 20 min. or until heated through. Top with olive mixture. Serve with crackers. Spread cheese mixture onto bottom of 9-inch microwaveable pie plate. Microwave on HIGH 3 to 5 min. or until heated through. Carefully remove from microwave. (Plate will be hot.) Top with olive mixture.